Meeting location: Angeles Crest Highway, 1 block north of 210 Freeway. If you miss us, drive 10 miles up ACH and turn right for the spur road down to Switzer Picnic Area. 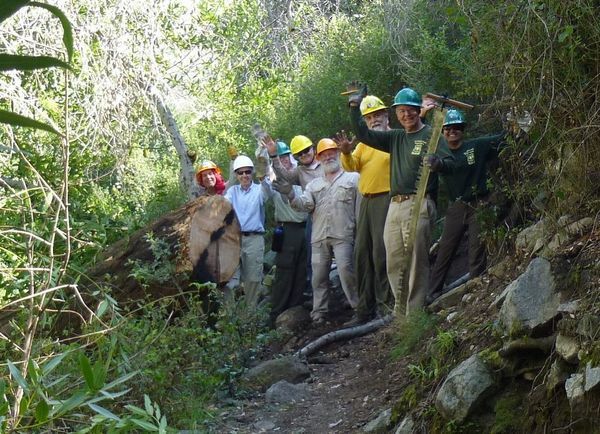 Our plan is to repair trail damaged by winter storms. Hike will be 6 miles with 600′ gain going in and on return. There will be many stream crossings and water levels are high, so you may wish to bring hiking poles. Trail work will consists of brushing, light tread work and log removal. Primary emphasis is on making the trail more visible and removing hazards. We try to accommodate each persons needs regarding tasks and hope that you have a productive and enjoyable experience. We will provide tools but you can bring your own if you prefer. Hat, gloves, long pants & long-sleeved shirt, good boots and safety glasses are recommended (hard hat will be provided.) Sandals & sneakers are not allowed. Please be sure to bring water and your lunch. We will bring extra hard hats, gloves and safety glasses but you are welcomed to bring your own (sunglasses are OK). We hope to be back to Switzer by 4:30 pm.